The new app is still in beta, and will read location data to intelligently present auto responses. Distracted driving is a major cause of concern for accidents across the world, and the rate of such accidents have been on a steady rise with more and more involvement of smartphones in our lives. Samsung's latest mobile application aims to solve this very problem in a bid to ensure lesser distractions. Called In-Traffic Reply, the application will automatically respond to messages when you are driving and not send notifications through. The app is still under development and is undergoing beta testing in The Netherlands. It will reportedly use the phone's GPS signal and accelerometer to detect your speed of travel and judge whether or not to allow the user to see a message. The automated responses include a preset "I'm driving, cannot respond at the moment", or a GIF and/or custom messages. The rest of the app's operations have not been spoken about yet, but it will possibly get a manual override mode for passengers, and speed limits within which you can access urgent messages. Samsung had previously taken a similar step with its S-Bike Mode launched last year, albeit with limited functionalities. The app essentially put a roadblock alert when bikers would receive a call while in transit. Emergency calls included a manual bypass mode for urgent access. 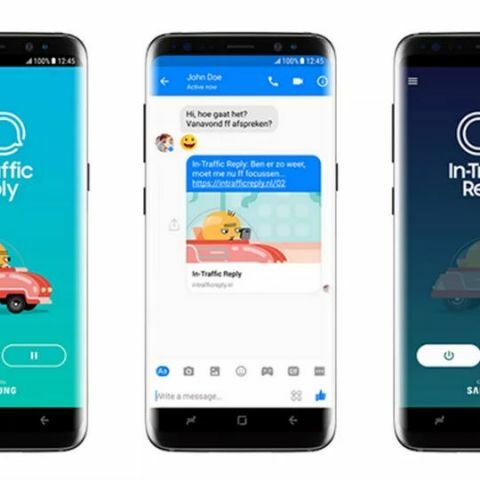 The new In-Traffic Reply app, meanwhile, will possibly impose stricter restrictions on accessibility of phone while driving. New-age car technology has been putting increasing emphasis on driving safety, with HUDs, voice assist and blind spot detection being some of the elements. Despite that, certain distractions always persist, and it is somewhat ironic that we need a smartphone to ensure less distraction from smartphones themselves.